A fully self contained separate studio apartment overlooking the lake. A pool surrounded by a tropical garden tropical where you can relax, after a cruise on the lake or a trip from the vineyards. Our Studio apartment is entirely self-contained with a king sized bed, and electric blanket, it also has a sofas one being a fold out bed, for more accommodation, a reverse-cycle air conditioner, spacious bathroom with individual bathrobes. The kitchenette is fully equipped with microwave, cooktop, electric frying pan and fridge. We also have a private verandah to enjoy your cup of coffee/tea or a glass of wine. All our guests are welcomed with fresh flowers in their apartment. 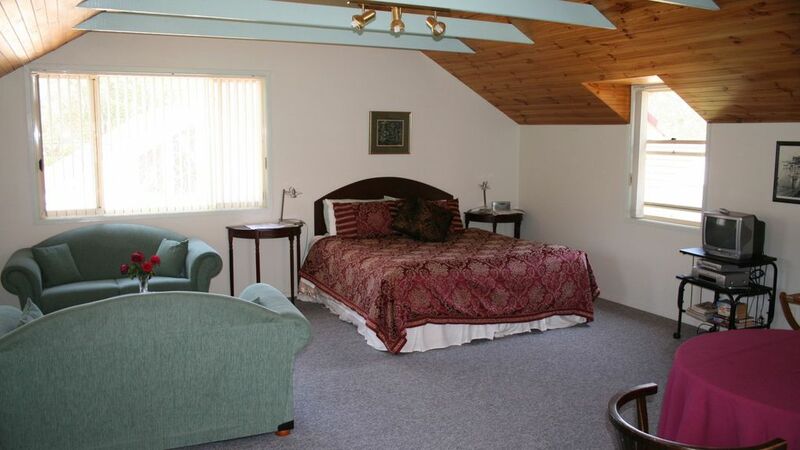 Our self contained cottage has a separate bedroom containing a queen sized bed and a large bathroom. The kitchen includes a full sized stove, fridge and microwave oven. There is a large covered out door area with a BQQ facilities and sitting area, or to park your car undercover. The lounge has a sofa that can open into a double bed, with lovely wooden floors. There is a TV and reverse cycle air conditioning unit with views of the lake. Our guests are welcomed with fresh flowers in the Garden Cottage. We booked two nights in the studio apartment at the Gables. The acommodation was perfect, quiet beautiful location, wonderful gardens, the room was clean and furnished perfectly. The Breakfast was scrumptous.When we checked in we offered to pay cash, but the owner said she would prefer a online deposit. We completeled the online banking transaction through our small rural building society with our mobile and thought all was settled. Unfortunately confirmation had not gone through to the owners account by checkout time and she became very rude and threatened to call the police. The owner demanded to see a print out of the transaction. We explained that we did not pack a printer and attempted to show her the transaction on our phone screen, but she refused and continued to threaten us with calling the police. All in all this nearly spoilt what had been a wonderful weekend in a great bed and breakfast. I do hope the owner learns from the experience and we are still waiting an apology.